Front row, from left: Rep. Jackie Speier, Kimochi Board President Paul Chin, Lawrence Cappel, board chairman of the Peninsula Health Care District, and Jun Yamada, consul general of Japan in San Francisco. Back row: State Sen. Jerry Hill, San Mateo City Councilmember Rick Bonilla. SAN MATEO — San Francisco-based Kimochi Inc. held a ribbon-cutting ceremony on Feb. 22 to celebrate the completion of construction of Kimochi San Mateo, a community care center for Peninsula seniors, located at 453 N, San Mateo Dr. 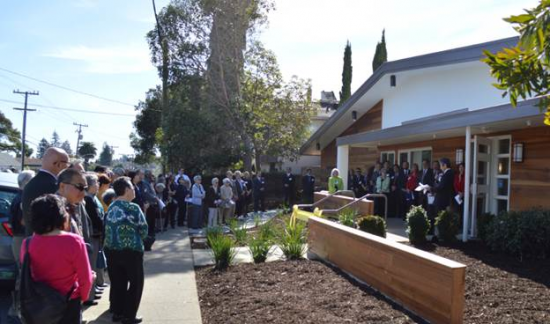 The ceremony was a culmination of five years of planning, fundraising and construction to bring the Kimochi tradition of care to San Mateo County seniors and their caregivers. Steve Ishii, Kimochi associate director, and Anna Sawamura Higaki, Kimochi program director, led the San Mateo project from inception and will continue to oversee its operations and service. Rep. Jackie Speier (D-San Mateo) was a key guest along with Consul General of Japan Jun Yamada. Both have been long supporters of Kimochi and the San Mateo project. Also in attendance were State Sen. Jerry Hill (D-San Mateo), San Mateo City Councilmmember Rick Bonilla and Lawrence Cappel, board chairman of the Peninsula Health Care District. Media personality Jan Yanehiro presided over the festivities. Kimochi San Mateo open house guests listening to Consul General Jun Yamada’s opening remarks during the ribbon-cutting ceremony. The ribbon-cutting was followed by an open house to introduce key donors and supporters to the new facility. In recognition of their giving, Kimochi San Mateo’s lobby features a donor wall, known as the Tomoye and Henri Takahashi Wall of Appreciation, that recognizes the many families, friends, community supporters and corporations who have gifted $2,500 or more to the project. The Wall of Appreciation was conceived and designed by nddCreative. Kimochi San Mateo will provide residential care for 14 seniors, both ambulatory and non-ambulatory, with future plans for home-delivered meals, transportation services and adult social day care. Eight rooms have private patio space; renovations also include a kitchen upgrade, expanded lobby and creation of a dining/activity center. Kimochi Inc., a nationally recognized senior service organization (tax ID 23-7117402), was established in 1971. 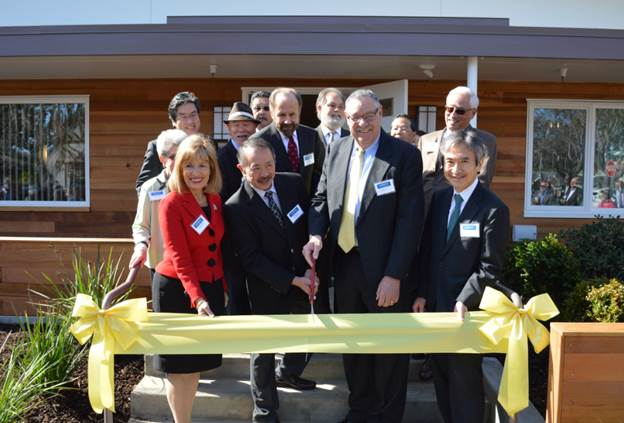 The Kimochi San Mateo facility will extend the “kimochi” Japanese tradition of care to Peninsula seniors. “Kimochi” is a Japanese term for “feelings from the heart,” which reflects the organization’s philosophy of care. The center will be open to seniors of all ethnicities, with focus on Japanese and Japanese-speaking senior population. First move in-date for residents is anticipated to be in April.